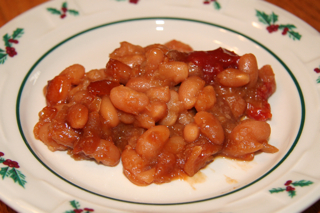 I learned to bake these beans from my Mom, Irene Bartholomew. She was well known for her beans! Soak beans in water overnight or 6 to 8 hours. Add ham hocks to the beans and boil until beans are soft. Be sure to continue to add water because they will boil dry, and make sure you boil until done because the beans will not get any softer when baking. Remove the ham hocks from the beans and remove all the meat from the hocks and put with the beans. Put beans in a roaster (at this point they will have enough water to cover the beans). Add the ketchup and brown sugar to the beans. Stir a little so that the sugar is under the water. Then take the molasses and write IRENE on the top of the beans. Bake at 350º for about 3 to 4 hours.